Canal front homes are just one home-buying option that lets you enjoy Oswego Lake. If you’d like to see one that is currently on the market, give me a call at 503.939.9801. Oswego Lake adds to the quality of living in Lake Oswego. Whether it’s looking at it, boating or swimming in it, paddle boarding on it, or dining on its shores, the lake is one of the things that makes living in Lake Oswego great. But you don’t have to own a million dollar lakefront home to enjoy it. There are other home-buying options in Lake Oswego that give you access to the lake. Here they are. VIEW. Homes with a lake view. Perched on streets like Upper or Summit Drives, you can enjoy the scenic beauty of Oswego Lake without paying waterfront prices. Some of these homes also offer you the opportunity to belong to an easement which affords you water access as well. Right now you can purchase a lake view home for anywhere between $849,000 and $3,895,500. LAKEFRONT. These homes give you everything—view and access, but at a price. Currently there are 18 lakefront homes for sale ranging in price from $1,200,000 to $10,500,000. In addition, you are responsible for paying Lake Corporation fees that are based on your water frontage. CANALS. Oswego Lake has two canals: Blue Heron and Oswego Canal. Both offer a water view, albeit of the more narrow canals rather than the lake, as well as access. Homes have boat houses, and depending how far down the canal you live, feature boat rides anywhere from one to seven minutes to get to the main lake. What you get with many of the canal front homes that lakefront homes lack, is a sizeable yard. Many of the lots, particularly on Lake Haven Drive and Kelok are deep, and some contain swimming pools as well as yards large enough to entertain over a hundred guests. They are also situated in neighborhoods that add to the community feel for residents. There are six canal front homes for sale at this time ranging between $849,000 and $1,999,000 (now pending). Lake Corporation fees also apply. CABANAS. Ten cabanas are situated on Lakewood Bay, at the end of Third Street in the Oswego Lake Sailing Club. Originally designed by Richard Sundeleaf as exclusive rental properties in 1936, these home sites range from the original footprint of 915 square feet to 3,319 square feet in new construction. The location is perfect not only for enjoying the more peaceful Lakewood Bay but also for walking to downtown Lake Oswego and taking in special events like the 4th of July ski show and the Oswego Heritage Council wooden boat parade. Prices range from $900,000 to $1,750,000. Lake Corporation and association fees are extra. BAYS. There are three bays on Oswego Lake: West Bay and Blue Heron on the southwest end and Lakewood Bay on the northeast end. Homes here offer scenic views of quieter water than the main lake as well as water access. A “no wake zone” is enforced in both West Bay and Blue Heron, so residents don’t have to deal with the noise of high speed boats or the wakes created by ski bobbing or wake boarding. Currently there are six homes for sale on the bays ranging from $900,000 to $2,595,000 with annual Lake Corporation fees extra. EASEMENTS. Twenty easements located around the lake give 3,000 non-waterfront homeowners the opportunity to live the lake lifestyle without paying waterfront prices. Each easement only has a limited number of boat slips for which there can be a waiting list. 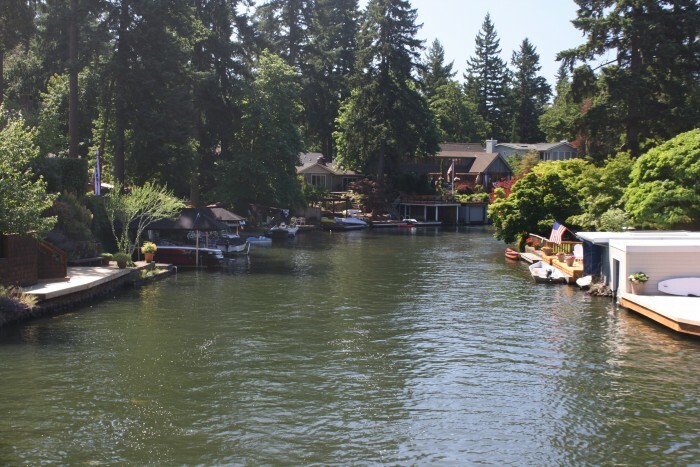 Once a boat slip is secured there is an annual easement fee as well as Lake Oswego Corporation fees, an annual meeting and usually a maintenance workday. Some easements also hold socials. LAKE GROVE SWIMPARK BOUNDARY. The Lake Grove Swim Park is run by the Lake Oswego School District and is open to residents who live within the boundaries of the former Lake Grove School District according to the original deed spelled out by Oregon Iron & Steel Company. (Check to see what houses reside within the boundary). While that district is now part of the LOSD, residents within those original boundaries still pay an additional property tax to support the park. Ask anyone who uses it, and they’ll tell you it’s well worth it. The park opens the first weekend after school lets out and stays open seven days a week from 12 noon to 8:00 p.m. through Labor Day. Lifeguards are on hand at all times ensuring kids stay safe, enforcing rules and administering swim tests which allow children to swim in roped off areas of different depths. Picnic tables, barbecues, a play structure, concession stand and games round out a summer afternoon for most families. CONDOMINIUMS. In 2006, 60 condominium conversion units went on the market in what is now The Villas on Lake Oswego (formerly part of the Bay Roc apartments). Many units afford lake views and balconies as well as boat slips and a common dock. These one-to-three bedroom units offer a more affordable way to get lake access with sales this past year ranging from $116,000 to $360,000. The Edgewater Garden Court Condominiums at 55 N. Shore Road and the Lakewood Lofts and Condominiums at the end of Third Street both offer lake views but no access. Most recent sales at The Edgewater in the 2011-2012 ranged from $257,000 to $275,000. Prices are higher at the Lakewood Lofts and Condominiums with sales of $239,000 and $430,000 in 2011. ANY LAKE OSWEGO HOME. Any resident of Lake Oswego can use the Lake Oswego Swim Park located at 250 Ridgeway Road. It is usually open through July and August in the summer from 1:00 p.m. to 6:00 p.m. If you’d like to check out some of these Lake Oswego homes, please give me a call at 503.939.9801. I can show you around and help you decide which home-buying option is best for you. This entry was posted in Lake Oswego homes, Lake Oswego lifestyle and tagged Homes with a lakeview in Lake Oswego Oregon, Lake Oswego canal front homes, Lake Oswego Oregon, Lake Oswego waterfront homes. Bookmark the permalink.